18+. UK only. NOW TV account set up with debit/credit card required to activate NOW TV Smart Stick. 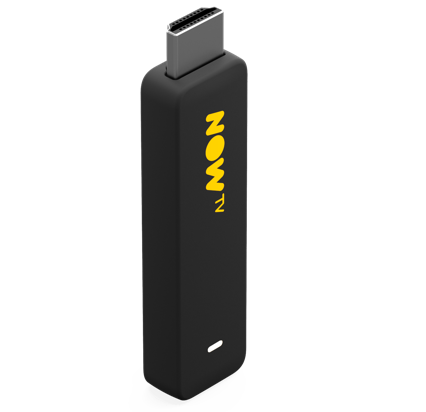 Product is an HDMI Stick for your TV only. HDMI extender may be required for wall mounted/small TVs. Minimum clearance of 10cm (l) x 3cm (h) x 2cm (w) required to connect stick. Voice Search applicable to NOW TV content only. Streamed via Wi-Fi (min speed 2.5Mbps). NOW TV content streams in 720p. New customers simply enter the voucher code at sign up. Existing customers can apply the voucher to their existing account. Voucher inside to redeem your relevant NOW TV pack .Voucher expires 1 year after date of purchase. At the end of the pre-paid period month passes keep rolling unless cancelled (Entertainment Month Pass at £7.99 a month; Sky Cinema Month Pass at £9.99 a month; Sky Sports Month Pass at £33.99 a month). All passes other than that included in your chosen pack sold separately. Savings claims based on the cost of box and relevant content pass if purchased separately. Further terms apply.